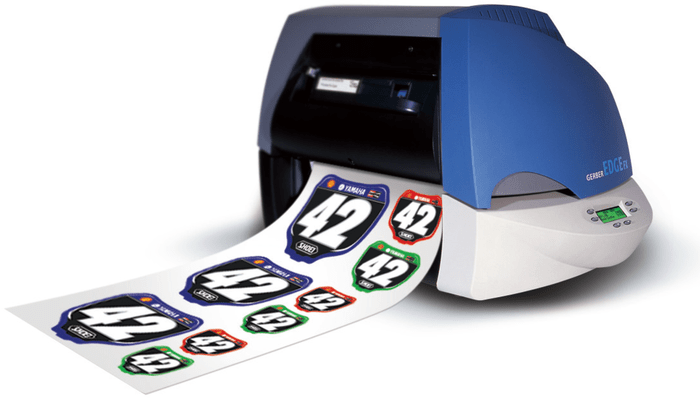 The GERBER EDGE Production system is a matched system that includes: The GERBER EDGE FX thermal transfer printer, GERBER OMEGA Software, Gerber 15″ sprocketed plotters, more than 30 EDGE READY materials and substrates, over 75 GerberColor Foils, and Gerber Service and Support. Maximum Resolution: 300, 600 or 1200 dpi on material axis (1200 dpi requires OMEGA 4.0 or later and EDGE FX firmware update). 300 dpi on head axis. Productivity: Base Speed up to 60" per minute per color at 300 dpi. 1 Color = 290 ft2/hr, 4 Color = 60 ft2/hr. Higher resolutions are slower. Foil Set: - GerberColor™ FX foil family and caddy.